This tutorial provides information on building and deploying dynamic Web application for an order-entry system using Dali. The mapped classes are packaged into a Web application, demonstrating one way to deploy JPA applications. This tutorial focuses on using Dali to map your classes to a relational database – the details of the Web application are not discussed in this document. For additional information, please visit the Dali home page at: http://www.eclipse.org/webtools/dali/main.php. This tutorial requires JSF 1.1. Do not use JSF 1.2.
commons-cli-1.0.jar Used to parse the command line arguments when populating the database. Dali_Tutorial_Web.zip Java source and Web files used for the tutorial dynamic Web project. dalimodel.jar The completed model project. This is used to create and populate the database and is also included for reference. populatedb.bat Script to create and populate the tutorial database schema. populatedb.jar Java source files used to create and populate the database. sources.zip Java source for the domain model classes that will be used in this tutorial. In this tutorial, you will create a dynamic Web application for an order-entry system. Figure: Advanced Tutorial Object Model illustrates the object model for this tutorial. The Item class represents the items that can be ordered or maintained in inventory. The Inventory class models items that are in inventory. The Order class represents a request for delivery of a particular item. 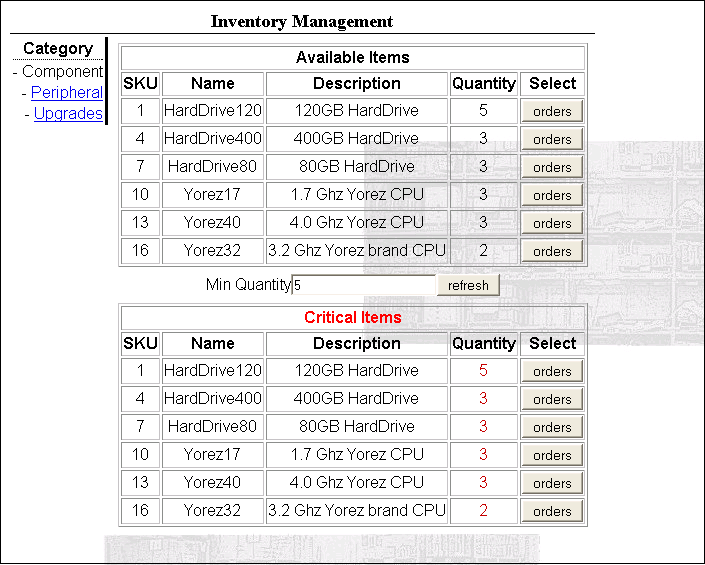 The advanced tutorial project uses three database tables to store each order: INVENTORY, ITEM, and ORDER_TABLE. Install Apache Derby and start the Derby database, using the Network Server framework. Refer to the Derby documentation (http://db.apache.org/derby/) for details. Be sure to correctly set your DERBY_INSTALL and classpath variables. Place the toplink-essentials.jar and derbyclient.jar files in the same directory as the populatedb.bat file. After creating and populating the database you will need to create a database connection to use with the tutorial application. An active database connection is required to complete the tutorial application. In Eclipse, use the New Connection wizard to create a database connection. Refer to "Creating a Connection Profile" in the Eclispe online help for more information. 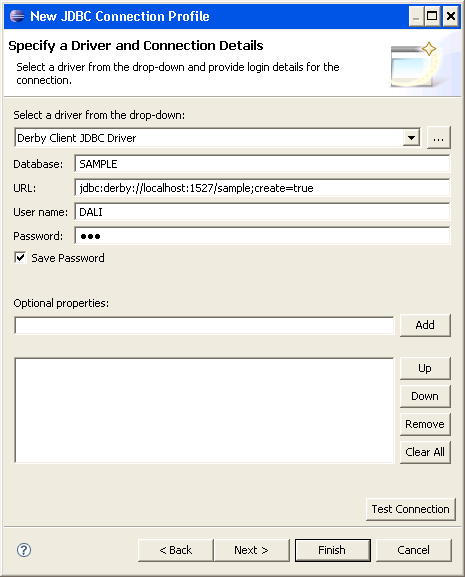 Use the SQL Model-JDBC Connection profile to create the connection. Open the Data Source Explorer view to display the tutorial database. To begin the tutorial, you must create a new Eclipse project. This Java project will contain the model classes for the tutorial application. On the New Project dialog, select JPA > JPA Project and click Next. The New JPA Project wizard appears. On the New JPA Project page, enter the following information and click Next. In the Project name field enter Dali_Tutorial_Model. 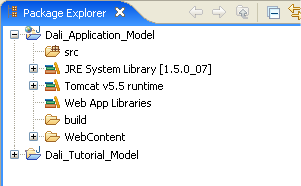 In the Target Runtime area, select Apache Tomcat. If you do not have a defined Apache Tomcat target runtime, you must create one. Refer to "Defining the installed server runtime environments" in Web Application Development User Guide for details. 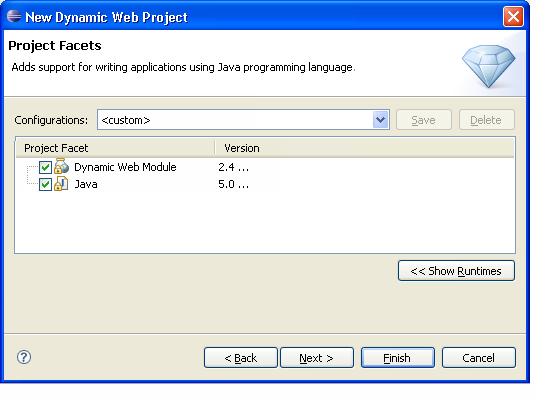 In the Configurations area, select Utility JPA Project with Java 5.0. The Project Facets dialog appears. On the Project Facets page, select the following options and click Next. The JPA Facet dialog appears. In the Platform field, select Generic. In the Connection field, select the database connection that you created previously. In the JPA Implementation Library area, click Configure default JPA implementation. 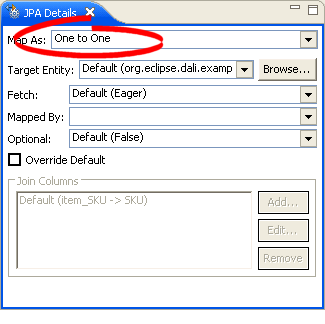 The JPA Preferences dialog appears. Click Configure user libraries. The User Libraries dialog appears. Click New to create a new user library, named TopLink Essentials, that contains the toplink-essentials.jar (see "Requirements and installation" for details). On the User Libraries dialog, click OK. The JPA Facet dialog appears. On the JPA Facet page, in the JPA implementation area select Use implementation library then use the drop-list to select the TopLink Essentials implementation library that you previously created, and click Finish. Complete the remaining fields on the JPA Facet page and click Finish. In the Persistent class management area, select Annotated classes must be listed in persistence.xml. Eclipse creates the JPA project and opens the JPA perspective. The Advanced Tutorial Object Model contains three entities: Inventory, Item, and Order. Use this procedure to add the classes to the project. Later, you will change them to persistent entities. Right-click the project in the Package Explorer and select New > Class. The New Java Class dialog appears. On the New Java Class page, enter a package name and class name and click Finish. For this tutorial, use org.eclipse.dali.example.jsf.inventory.model as package and Inventory as the class name. 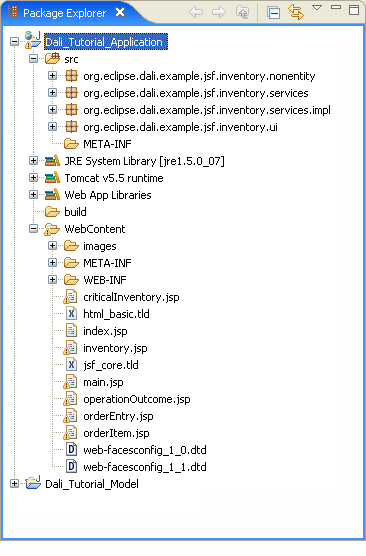 Eclipse adds the Inventory class to the Package Explorer. Repeat this procedure to add the Item and Order classes. Before mapping the entities to the database, you must add the necessary fields to each entity. Now you will change each class to a persistent entity. You must also associate each entity with its primary database table. In the Package Explorer view, open Inventory.java. 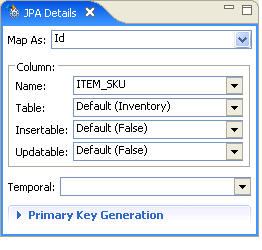 In the JPA Structure view, select the Inventory entity. 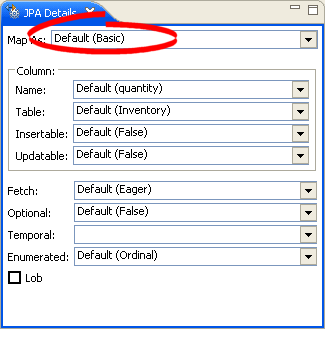 In the JPA Details view, in the Map As field select Entity. Eclipse adds the @Entity annotation to the class. 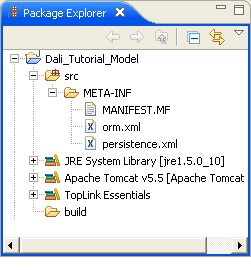 In the Package Explorer view, right-click the persistence.xml file select JPA Tools > Synchronize Classes. This will update the persistence.xml file with the newly added entity. In the JPA Structure Properties view, notice that Dali has automatically identified the default table, Inventory, associated with the entity. Repeat this procedure to create entities from the Item and Order classes and then associate the entities with the database tables. By default, entities are associated with a similarly named database table and Dali identifies these defaults. Like the Inventory entity, even though you have not explicitly associated the Item entity with a database table, there is no error in the Problems view because the entity name, Item, is identical to the table name (Item). 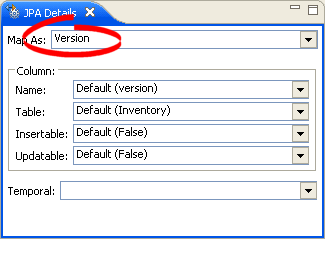 Because the Order entity is named differently than the database table (ORDER_TABLE), you must explicitly create the association (as shown in Figure: JPA Details view for the Inventory Entity). Dali adds the @Table(name="ORDER_TABLE") annotation to the Order entity. Remember to resynchronize the persistence.xml file after creating and associating the entities. Use an ID Mapping to specify the primary key of an entity. Each persistent entity must have an ID. Notice that the Problems view reports that each entity "does not have Id or EmbeddedId." 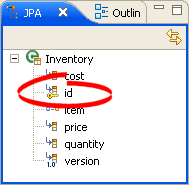 Expand the Inventory entity in the JPA Structure view and select the id field. The JPA Details view displays the properties for the field. In the Map As field, select ID. Use this table to complete the remaining fields on the General tab in the Persistence Properties view. Map As Defines this mapping as an ID Mapping. Dali adds the @Id annotation to the entity. Column The database column for the primary key of the table associated with the entity. Select ITEM_SKU. Because the database column (ITEM_SKU) is named differently than the entity field (id), Dali adds the @Column(name="ITEM_SKU") annotation. Anytime you override the default, Dali adds the @Column annotation. Insertable The value of the id field is obtained from the Item entity. Select False. Dali adds insertable = false to the annotation. Updatable The value of the id field is updated from the Item entity. Select False. Dali adds updatable = false to the annotation. The SKU field of the Item entity to the SKU column of the ITEM table. The orderId field of the Order entity to the ORDERID column of the ORDER_TABLE table. Expand the Primary Key Generation area. 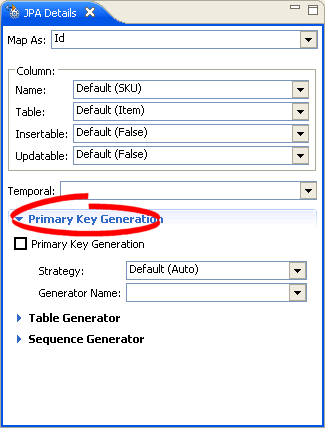 Select the Primary Key Generation option. Use this table to complete the remaining fields in the JPA Details view. Generated Value These fields define how the primary key is generated. Dali adds the @GeneratedValue annotation to the entity. Strategy For the tutorial project, leave this as the Default (Auto). Generator Name Leave this field blank. Use a Basic Mapping to map an attribute directly to a database column. 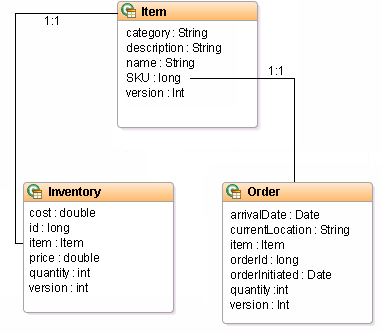 In the object model, the quantity field of the Inventory class maps directly to the QUANTITY column of the INVENTORY database table. 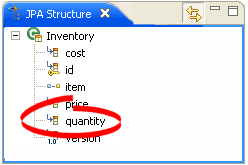 In the JPA Structure view, select the quantity field of the Inventory entity. The JPA Details view displays the properties for the field. Notice that Dali has already identified the mapping as the Basic mapping type. By default, all attributes of the following types use Basic mapping: Java primitive types, wrappers of the primitive types, java.lang.String, java.math.BigInteger, java.math.BigDecimal, java.util.Date, java.util.Calendar, java.sql.Date, java.sql.Time, java.sql.Timestamp, byte, Byte, char, and Character. Notice that Dali has automatically identified the QUANTITY field and INVENTORY table for this mapping. Dali identifies the defaults for the mapping. In the JPA Details view, use the Temporal field to select Date. Dali adds the @Temporal(DATE) annotation to the mapping. Use a One-to-One Mapping to define a relationship from an attribute to another class, with one-to-one multiplicity to a database column. In the object model, the item field of the Inventory class has a one-to-one relationship to the Item class; each inventory object contains a single item. 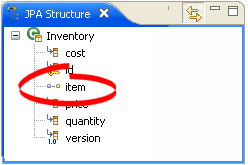 In the JPA Structure view, select the item field of the Inventory entity. The JPA Details view displays the properties for the field. In the Map As field, select One-to-One. Dali has identified the default Target Entity for the mapping: org.eclipse.dali.example.jsf.inventory.model.Item. 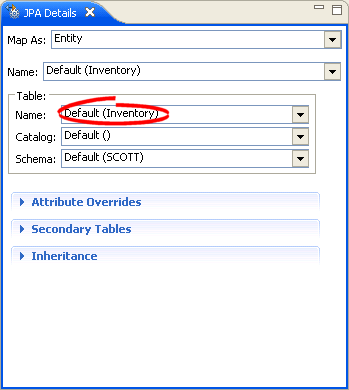 Create a one-to-one mapping from the item attribute of the Order entity to the Item. Use a Version Mapping to specify the database field used by a persistent entity for optimistic locking. 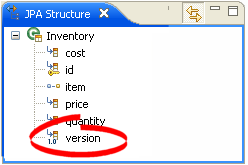 In the JPA Structure view, select the version field of the Inventory entity. The JPA Details view displays the properties for the field. In the Map As field, select Version. Add the following query to the Inventory entity, immediately following the @Entity annotation. Add the following queries to the Order entity. When you originally added persistence to the project on the Add Persistence dialog, you selected to create the persistence.xml. Dali created a basic file, containing the persistence unit and provider information. Use this procedure to add the entities to the persistence.xml file. If you have not synchronized the persistence.xml file, do so now. 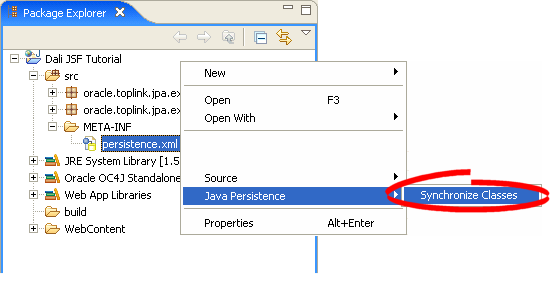 Right-click the persistence.xml file in the Package Explorer and select JPA > Synchronize Classes. This information should be identical to the values that you used when creating the database connection (see Figure: Creating a Database Connection). To complete the tutorial, you must create a Web project. This Web project will contain the business logic and presentation files for the tutorial application. 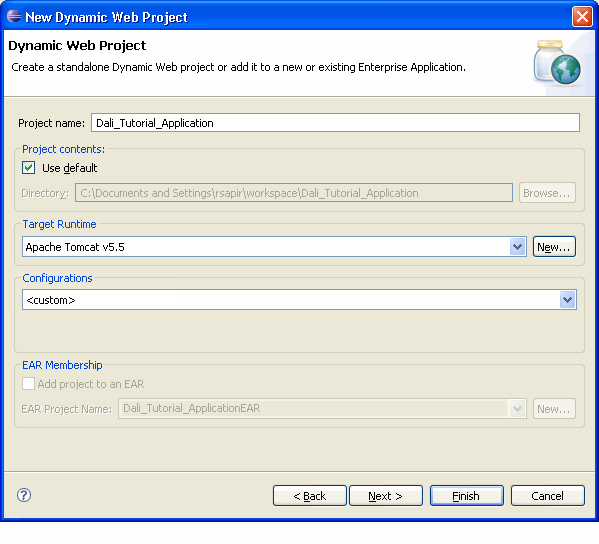 On the New Project dialog, select Web > Dynamic Web Project and click Next. The New Dynamic Web Project wizard appears. In the Project name field enter Dali_Tutorial_Application. In the Target Runtime field, select your Web server configuration (for this tutorial, select Apache Tomcat v5.5), or click New to create a new configuration. In the Configurations field, select Custom. On the Project Facets page, verify that the Java facet uses version 5.0 and click Finish. Eclipse creates an new Web project. Use this procedure to associate the Dali_Tutorial_Model project with the Dali_Tutorial_Application project. Right-click the Dali_Tutorial_Application project in the Explorer and select Properties. 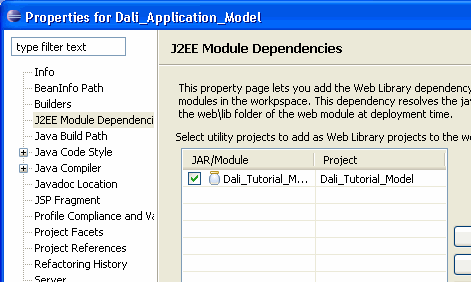 Click J2EE Module Dependencies, select the Dali_Tutorial_Model project, and click OK. The Dali_Tutorial_Web.zip (included with http://www.eclipse.org/webtools/dali/docs/tutorial/jsf/Dali_Tutorial_Application.zip) file contains the non-entity source files and Web content files for the dynamic Web project. Unzip the Dali_Tutorial_Web.zip file into your Dali_Tutorial_Application project's directory. You are now ready to deploy the tutorial application to your server. 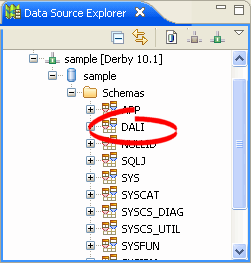 Right-click the Dali_Tutorial_Application project in the Explorer and select Run As > Run on Server. The Run on Server dialog appears. If you have not yet defined a server, the Define a New Server dialog of the Run On Server wizard appears. Use this wizard to define a new server. For this tutorial, create a Tomcat v5.5 server. Select the Choose an existing server option, select your sever, and click Finish. The Server view shows the status of your sever and the tutorial application. The Console view shows the status of the compilation, build, and deployment. A new view opens, displaying the web page for the tutorial application. If you did not receive this Content directly from the Eclipse Foundation, the Content is being redistributed by another party ("Redistributor") and different terms and conditions may apply to your use of any object code in the Content. Check the Redistributor's license that was provided with the Content. If no such license exists, contact the Redistributor. Unless otherwise indicated below, the terms and conditions of the EPL still apply to any source code in the Content.